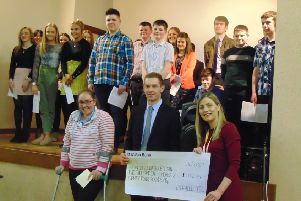 Gleno Valley Young Farmers’ Club annual fatstock show and sale and charity auction will be held at Ballymena Livestock Market on Thursday, November 29th. Sponsors have once again been more than generous, donating towards a grand total on offer to be won throughout the classes. These sponsors consist of Norbrook Laboratories, Fane Valley, Newport Collection, Moore Concrete, Clare Vet Group (sponsoring Butchers Best), Danske Bank, DJ McKee and Sons, Ballinaskeagh Grains, NI Limousin Club and Jacksons Butchers. The classes are Butchers Best (less than 560kg), British Blues, Charolais, Limousin, Blonde D’Aquitaine, Native Breed, any other breed and YFC class (all animals in breed classes can be of any weight). Judging begins at 1.30pm sharp followed by the sale at 7.00pm. For more information contact club secretary, Stephanie McIlroy on 07581288645. Following the sale, a charity auction in aid of Friends of the Cancer Centre will take place. Gleno Valley YFC have already received numerous generous donations. All money raised from the auction will be combined with all entry fees along with donations collected.